Over the next month or so UNITYblog will be examining “Leninism in the 21st Century”. We’re seeking the views of socialists and other radicals on the relevance of the Russian revolutionary’s theory of party organisation in today’s struggle against capitalism. This week, we will start by posting articles from Marxists in the Leninist tradition who have taken a new look at Leninism over the last few years. Has anyone heard if Chavez has presented “What Is to Be Done?” to Obama? Lars Lih, the author of Lenin Rediscovered: “What Is to Be Done?” in Context, which offers a new interpretation of Lenin’s 1902 book, comments on the news that Hugo Chávez has a new book ready to present to Barack Obama. 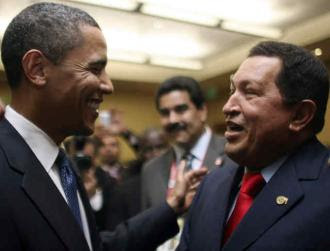 HUGO CHÁVEZ, the president of Venezuela, has announced on Venezuelan television that the next time he meets with President Barack Obama, he will give the American head of state a short book written in 1902 by one Lenin, entitled What Is to Be Done? A surprising announcement. The last time Chávez showed his willingness to fill out Obama’s reading list, he gave him a topical book on the situation in Latin America. But what topical interest can be found in a book over a century old, written under the drastically alien circumstances of Tsarist Russia? Besides, many of us will remember being taught about this book in a poli sci or history class. Isn’t What Is to Be Done? a “blueprint for Soviet tyranny”? Isn’t this the book in which Lenin expressed his contempt for workers--or, in any event, his worry that the workers would never be sufficiently revolutionary? These worries, so we are told, led Lenin to advocate a party of “professional revolutionaries” from the intelligentsia that would replace a genuine democratic mass movement. All in all, isn’t What Is to Be Done? something of an embarrassment for the left--a book much better forgotten than thrust into the hands of world leaders? I am not privy to Chávez’s thoughts on the matter. But having recently spent several years of my life retranslating What Is to Be Done? into English and recreating the historical context for Lenin’s book, I feel qualified to clear up some of the confusions and misconceptions that surround the book. In preparation for my study Lenin Rediscovered, I read every piece of writing mentioned by Lenin in What Is to Be Done?--and since Lenin was intensely polemical, I had a lot of ground to cover. I had to become well versed not only in the intricacies of the infighting among the Russian revolutionaries, but also in the ways in which the Western European workers parties inspired Lenin and his comrades. I had to get a sense of the exact political conjuncture in Russia in the few months in late 1901 and early 1902 during which Lenin hastily penned his treatise. A blueprint for Soviet tyranny? On the contrary, What Is to Be Done? represents a heritage that had to be rejected before Soviet tyranny could be established. An expression of elitist “worry about workers”? On the contrary, Lenin goes way overboard in his sanguine optimism about the workers’ revolutionary fervor. Lenin’s organizational suggestions are all about reconciling the contradictory imperatives of avoiding arrest in the underground while simultaneously creating extensive roots in the Russian worker community. As for topicality--well, we shall see. AT THE turn of the 20th century, Tsarist Russia was run by a religiously sanctioned elite that was hostile even to the idea of political freedom--that is, freedom of speech, of press, of assembly, of autonomous organization. The Tsarist regime showed itself unable and unwilling to adjust to the challenges imposed by a world that was rapidly globalizing and putting pressure on Russia in terms of military rivalry, economic performance and the subversive political ideals wafting in from the West. To prove how incompetent they were, the Tsarist government got itself involved in a war with Japan and bungled it big time. More and more social groups in Russia were losing patience with the Tsar’s pretensions--not only such traditional troublemakers as the intellectuals or the national minorities, but also groups that the government had always assumed to be highly loyal, such as the peasants and even many opposition-minded landowners and businessmen. The industrial workers, in particular, were rapidly being politicized, thus becoming the most dangerous opposition force. All this inchoate and uncoordinated discontent could explode if the right spark fell in the right place--which is why Lenin and his friends called their underground newspaper The Spark (Iskra). The ultimate aim of their newspaper was to make the anti-Tsarist revolution happen. An underground newspaper published abroad could hardly provide directly leadership to the many discontented groups throughout the Russian empire. What it could do was make people aware that they were not alone, that discontent everywhere was growing, that Tsarism was becoming desperate, and that one group at least--the industrial workers--was increasingly ready to take to the streets, not only for their own sectional economic interests, but to obtain political freedom for all of Russia. Once society as a whole was imbued with this awareness, Tsardom was doomed. Such was the reasoning of Lenin and his friends. Today, of course, any such strategy would have to be adapted to forms of communication not dreamed of in 1902. But this strategy leads to a paradox. Lenin, the committed Marxist socialist, the future head of the Soviet one-party state, making political freedom in Russia his most urgent priority? Strange as it may seem--and ignored as it is by most Western historians--this is exactly the case. Lenin made political freedom his top priority precisely because he was a dogmatic Marxist socialist. Like many other Russians of his generation--both the intelligentsia and the workers--Lenin was inspired by the stirring example of the massive and powerful German Social Democratic Party (SPD). The SPD was a mass, worker-based party, officially committed to a Marxist brand of socialism, showing radical opposition to the German establishment, and growing in numbers and influence all the time. The outlook of the German party was based on the core Marxist proposition that socialism can only be introduced by the workers themselves, and so the main activity of the party consisted of a ceaseless round of propaganda and agitation, both aimed at spreading the socialist word among the workers. Russian Social Democrats were green with envy at the massive social democratic press, the noisy and crowded rallies, the eloquent denunciations by elected socialist deputies in parliament. But in order to emulate the German socialists, they needed something that didn’t exist in Russia: political freedom. Strange but true: the central aim of Lenin’s political career, at least up to the outbreak of war in 1914, was obtaining political freedom for Russia by revolutionary overthrow of the Tsar. The Russian proletariat--said the advocates of [economism]--had not yet matured enough to understand specific political demands; all that it was capable of now was the struggle for its economic needs. The Russian worker did not yet feel any need for political freedom. [But] in a country that has a despotic regime such as our Russian one, in a country where such elementary democratic rights as the right of free speech, assembly and so on, do not exist, where each worker strike is accounted a political crime and workers are forced by bullets and whips to return to work--in such a country, no party can restrict itself to the narrow framework of an exclusively economic struggle. And Mr. Lenin justly protests against such a program. Lenin’s Menshevik critics even accused Lenin of going overboard about political freedom, and thereby increasing the danger of letting the workers be politically exploited by the bourgeois liberals. In order to make his strategy plausible, Lenin had to make a strong case that the Russian workers were chomping at the bit to fight the Tsar and demand political freedom. And in fact, at the very time Lenin was writing What Is to Be Done? the growing militancy of the workers was evident to everyone--not least to the Tsarist authorities, who even tried setting up their own loyal worker movement in order to combat more revolutionary-minded organizations. For many, all of this will seem literally unbelievable, like arguing that Adolf Hitler was a philo-semite. We are talking about the Lenin, aren’t we, the one who founded a state noted for its lack of political freedom and its oppression of workers as well as all other groups? Yes, it’s the same Lenin alright--which means that What Is to Be Done? does not provide a ready-made explanation for the evolution of the Soviet system. Indeed, an accurate reading of Lenin’s 1902 book makes developments after 1917 harder to explain. THIS IS not the place to tackle the necessary explanations. But here’s a suggestion. The same exalted estimate of worker creativity and revolutionary fervor found in his writings of 1902 led Lenin in 1917 to believe that the dire economic crisis of that year could be easily solved simply by letting the workers smash the repressive state and forcing the capitalists to do their proper job. The result was an accelerated leap into complete economic collapse, and this, in turn, necessitated some dictatorial back-pedaling. Lenin’s organizational suggestions only make sense in the context of the aims that I have just outlined: spreading the word under repressive conditions. Thus, Lenin’s central organizational value was not conspiracy, but konspiratsiia. The aim of a conspiracy (zagovor in Russian) is to be invisible until the proper time. The Russian word konspiratsiia--one that had been used in Russian socialist circles for over a decade-- means the fine art of avoiding arrest, while spreading the word as widely as possible. The konspiratsiia underground was an underground of a new type, worked out bit by bit by local Russian praktiki who dreamed of applying the logic of the German SPD under the inhospitable conditions of Tsarist repression. Lenin’s organizational plan was not an original creation out of his own head, but rather a codification of the logic inherent in the konspiratsiia underground improvised by local activists. This applies in particular to Lenin’s most notable terminological innovation, the “professional revolutionary.” In my new translation, I render Lenin’s term as “revolutionary by trade,” which brings out the underlying metaphor better. But the essential point is that the professional revolutionary was a functional necessity of a konspiratsiia underground, and thus all Russian underground parties adopted the term and relied heavily on the type--that is, on activists devoted full-time to underground activity and ready to move from place to place so that local organizations did not fall into demoralizing isolation. The concept of “professional revolutionary” has nothing to do with the intelligentsia vs. the workers. The reliance on professional revolutionaries is precisely what does not separate Lenin’s Bolsheviks from other underground factions. In Lenin’s application, a properly organized party was the place to stand, but the lever itself was the cascading revolutionary awareness that would amplify the message of a small group of activists and turn it into a revolutionary onslaught against the autocracy. Lenin focused on organization because everything else--the enthusiasm of the masses, the universal hatred of the autocracy--was at hand. How topical are the suggestions found in Lenin’s 1902 book? Let the reader judge. The situation Lenin faced was something like this: there existed a potentially wide social consensus in opposition against a religiously sanctioned regime, noted both for its hostility to political freedom and its growing inability to respond to paramount social needs in a globalizing world. Some of the potential opposition groups have a greater capacity than others to combine militant activity on the streets with focused political aims that can unite the opposition. There also exist committed group of activists with international contacts, ready to go underground to spread the word. These are the parameters of the problem as Lenin saw it. Of course, any solutions to similar problems today cannot follow the details of the one Lenin came up with. But they can emulate the creative communication strategies and the focused organizational improvisations that made Lenin’s book such a hit--not only for the Russian undergrounders in 1902, but for the likes of Hugo Chávez.